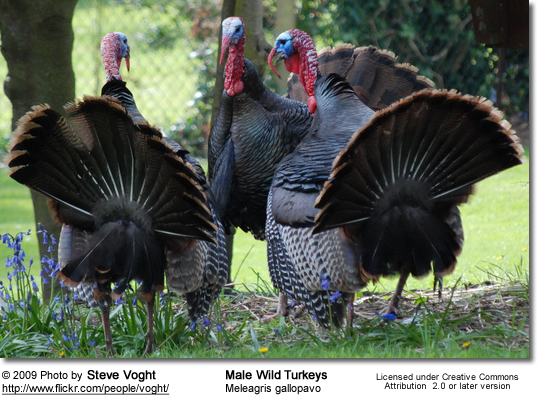 Eastern Wild Turkeys (Meleagris gallopavo silvestris) - Their range covers the entire eastern half of the United States; extending also into Ontario, Quebec, and the Maritime Provinces in Canada. They number from 5.1 to 5.3 million birds. 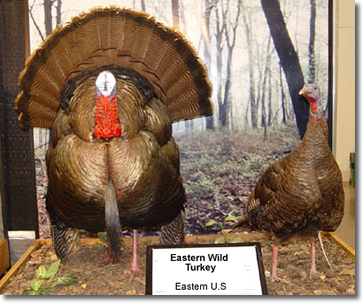 They were first named forest turkey in 1817, and can grow up to 4 feet tall. The upper tail coverts are tipped with chestnut brown. 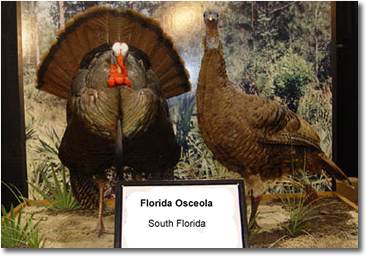 Osceola or Florida Turkey (Meleagris gallopavo osceola) - These variety is only found on the Florida peninsula. They number from 80,000 to 100,000 birds. This bird is named for the famous Seminole Chief Osceola, and was first described in 1980. It is smaller and darker than the Eastern turkey. The wing feathers are very dark with smaller amounts of the white barring seen on other sub-species. Their overall body feathers are iridescent green-purple color. 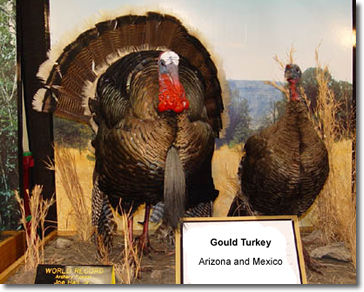 Gould's Wild Turkey (Meleagris gallopavo mexicana) - They are native from central to northern Mexico and the southern-most parts of Arizona and New Mexico. Heavily protected and regulated. First described in 1856. They exist in small numbers but are abundant in Northwestern portions of Mexico. A small population has been established in southern Arizona. Gould's are the largest of the five sub-species. They have longer legs, larger feet, and longer tail feathers. The main color of the body feathers are copper and greenish-gold. 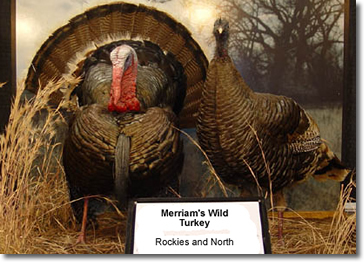 Merriam's Wild Turkeys:(Meleagris gallopavo merriami) - Ranges through the Rocky Mountains and the neighboring prairies of Wyoming, Montana and South Dakota as well as much of the high mesa country of New Mexico. They number from 334,460 to 344,460 birds. They live in ponderosa pine and mountain regions. Named in 1900 in honor of C. Hart Merriam, the first chief of the US Biological Survey. The tail and lower back feathers have white tips. They have purple and bronze reflections. 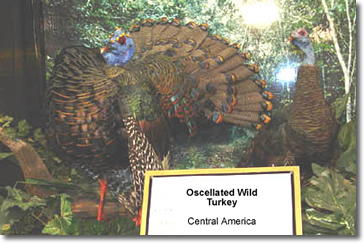 Ocellated Wild Turkey (Agriocharis ocellata) - This species is is not found in North America. 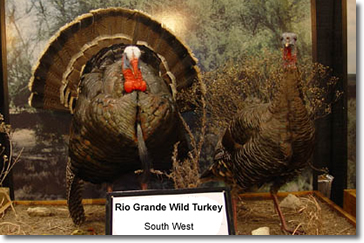 Rio Grande Wild Turkey (Meleagris gallopavo intermedia) - Ranges through Texas to Oklahoma, Kansas, New Mexico, Colorado, Oregon, and Central and Western California, as well as parts of a few northeastern states. Rio Grande turkeys were also introduced to Hawaii in the late 1950s. Population estimates for this subspecies range from 1,022,700 to 1,025,700. This sub-species is native to the central plain states. Their body feathers often have a green-coppery sheen to them. The tips of the tail and lowrer back feathers are a buff-very light tan color. This turkey's preferred habitat are the mountainous regions, forests and open woodland (scrub oak, and deciduous or mixed deciduous-coniferous areas). They are also found in agricultural areas in some regions; agricultural areas may provide important food resources in winter.